Weak supply chains, both in quantity and quality, impose logistical challenges on Mozambican manufacturing firms. The Mozambican regulatory and legal environment continue to be perceived as a hurdle. Regulatory barriers hinder firm capacity to export. Access to credit remains heavily constrained. Nearly half of firms do not find a business association to represent them. The 2017 Survey of Mozambican Manufacturing Firms builds on data collected in 2012 from surviving firms to trace how changing economic conditions have affected the development of firms over five years. The survey takes an in-depth look at the country’s manufacturing sector, encompassing its economic performance, commercial relations and business networks, credit and finance, informality, workforce, as well as leadership characteristics. Mozambique’s economic performance from 2003 was, in general, promising. Since then, the country’s real GDP per capita — measured in constant 2011 international US$ with purchase power parities (World Development Indicators) — has grown constantly and, mostly, at a very stable rate never below 3%. However, the growth dynamic began to lose momentum in 2014 and in 2016 it almost stalled. Faced with an external credit crunch and a strong currency devaluation in 2015, Mozambique’s macroeconomic performance reached a crisis point, and remains under stress. The findings from the 2017 Survey of Mozambican Manufacturing Firms demonstrates how challenging the business environment is. Logistical, regulatory, and financial restraints imply that Mozambican firms are not being fully enabled to function and thrive. Mozambican firms report difficulties with their supply chains, both regarding the quantity of input and regularity of supply and its quality. The regulatory and legal environment is still perceived as a hurdle. This starts when formalizing the businesses themselves, with firms reporting lack of transparency and occasional acts of corruption in the registry. Challenges extend to regular operations. Business people report lack of transparency about norms and regulations, some of them potentially arbitrary, with which they are confronted when subject to inspections by public officers. Similarly, close to half of the managers and entrepreneurs fear that authorities will close their firms. Regulatory barriers have implications for growth and expansion; for example, in the capacity firms may have in reaching foreign markets. The number of interviewed business people who reported to export is minute, with a significant majority of firms indicating the high cost of export licencing as the main reason not to take that step. Access to credit is heavily constrained, mostly due to lack of information, high demands of collateral required, and high interest rates. Even though they can identify potential benefits of belonging to business associations, a significant proportion of managers and firm owners, almost half, appear not to find one that duly represent their firms’ interests. Firms do not engage on social media in a significant way. How can the government help enable firms? The Mozambican government has pushed for measures to streamline and facilitate the relationship between firms and the state, notably through the Single Teller (Balcão Único) initiative and the simplification of fiscal obligations for micro and small firms. 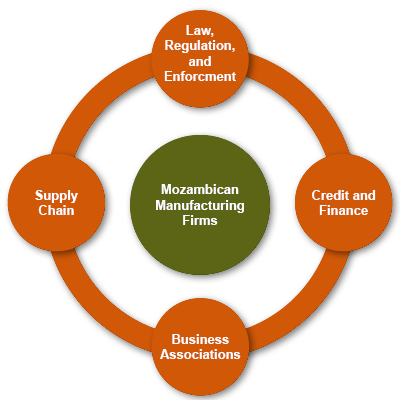 The 2017 Survey of Mozambican Manufacturing Firms suggests that the government should maintain and strengthen the momentum of its good policies, mobilizing and assisting public officials to carry out government policies diligently, transparently, and with full knowledge of the services which the state provides to firms. Continuous investment in training and supervision of public officials will surely result in more adherence of firms to formalization and, ultimately, a wider corporate tax base and larger tax return. Firms themselves will benefit from a clearer, more transparent, set of rules and, by formalizing, better access to credit and public contracts thus improving their financial management and increasing their revenue base. While firms reported difficulties accessing credit, the stifling of international credit to the Mozambican government led it to reach out to the Mozambican banking sector and increase national public debt. While there is an expectation of an eventual return of normal access to international financial flows, the challenge remains to increase the knowledge of the commercial credit opportunities the Mozambican banking sector has to offer to firms. The Bank of Mozambique, the commercial banks, and Mozambican business associations can and surely will reinforce their collaboration to better reach those manufacturers seeking credit, particularly when seeking to invest in productivity increase and innovation. The Mozambican government should maintain and strengthen its investment in training and supervision of public officials in the streamlining and facilitation of clear and transparent relations between the state and firms. The Bank of Mozambique, commercial banks, and Mozambican business associations should reinforce their collaboration to better reach those manufacturers seeking credit. The country’s strong efforts to promote internal stability and investments in road and railway improvement continue to be needed to help overcome weaknesses in supply chains. The most complex constraint to tackle seems to be embedded in the supply chains. In part, the weakness reported in the survey is a result of problematic access to credit for firms in general. Another important part, however, comes from a weak national transport infrastructure. The strong efforts to promote stability will, most likely, facilitate the much-needed investment in road and railway improvements which may foster inter-provincial connectivity and effective national economic integration. This Policy Brief, also available in Portuguese (disponível em Português), draws on the Survey of Mozambican Manufacturing Firms 2017.